KUWAIT: Safaa El-Kogali, the Education Practice Manager for the Middle East and North Africa (MENA) at the World Bank Group, said Thursday the educational reforms in Kuwait proceed according to a correct methodology. 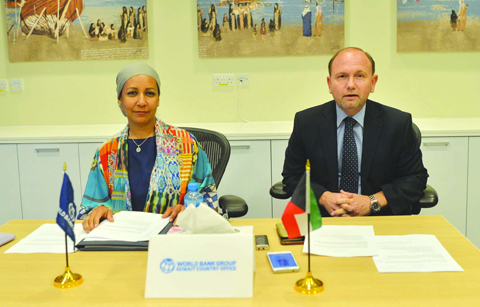 The modernization of education contributes to Kuwait’s economic development and helps bring about a better future for the country, she told reporters at the World Bank Kuwait Office at the conclusion of her visit to the country. The visit, part of a tour of countries in the region, aimed to review with education policymakers the latest developments in their plans for modernization, Kogali pointed out. During her stay in Kuwait, she discussed the country’s education program in relation to the development report 2018 that gauges the level of education based on the ability of a country to reach the desired targets of educational process. She pointed out that there has been a great development in a number of government schools since her last visits to the same schools two years ago. Kogali applauded as excellent and innovative the curricula developed by Kuwaiti experts, saying that these curricula instigate creativity in schoolchildren and integrate them into school atmosphere. The ultimate goal of Kuwait’s modern education is to tap into the role of education in economic development in the future, she went on. The World Bank is working with 188 countries to modernize their educational systems and build the capacity of teachers, she said, adding that training courses of teachers in the elementary and middle schools constituted a correct beginning towards unconventional education. Meanwhile, Director of the World Bank Kuwait Office Dr Feras Raad said the new curricula were developed by Kuwaiti experts in collaboration with the World Bank. Educational cooperation between Kuwait and the World Bank started two years ago, he said, adding that the World Bank is committed to providing the Kuwaiti Ministry of Education with the latest technologies in order to back up the country’s economic development plan. In other news, the decision to unify currency on financial allowances is exclusively for Civil Service employee abroad, not students sent by the higher education ministry, the ministry of Higher Education said Friday. Such decision is only for Civil Service employees, those who are working for the state and living abroad only, said Fatima Sinan, the Assistant Undersecretary for Scholarship and Culture Relations Affairs in the Ministry. Sinan added that the no changes would happen to students monthly allowances, which will be deposited during regular times of the month as usual. Separately, newly-elected Kuwaiti General Director of the Arab League Educational, Cultural and Scientific Organization (ALECSO) said the new position represents Kuwait’s educational and cultural efforts in the region. Kuwait won 16 votes out of 21 in the first round, Undersecretary for research and curriculums at the Ministry of Education and ALECSO’s General Director Saud Al-Harbi said in a press statement yesterday.